In addition to the original code for this article that is included at the link about you can grab the very latest version from GitHub using the link below. THe new updated version of this code has been updated to use Prism version 5 and compiles against .NET 4.5. If you’re a WPF application developer, you’ve probably heard about CAL by now. It seems to have a number of names that people know it by, CompositeWPF, Composite Application Library, Composite Application Guidance (CAG), and Prism. Frankly, it’s all a bit mad; from here on in, it’s called CAL. Unlike the growing issue of loads of different techs that essentially do the same thing, here we have a single tech with loads of different names! Anyway, I have now been involved in two large Composite WPF applications. One for my day-job employer, a smart desktop client application using WPF / WCF / CAL, and one for my own project. However, from my own experience and from talking to other developers, I think Microsoft sometimes do themselves a real disservice. CAL is awesome, and the documentation is very good and getting better, but the StockTraderRI is just a bit too much to take in at first. There are some excellent things people are doing with CAL (Daniel Vaughan’s Calcium, for one), but they aren’t really a strip it down to basics take on things; they are complex frameworks in themselves, so I thought I’d write this really cut down demo app. Before CAL arrived, I had already made a start on the two applications I referred to earlier. We were using a more traditional layered approach to their construction, utilising WPF commands, .NET events, dependency properties, data binding, data templates etc … all the normal bits and bobs that WPF and .NET provide in order to get a functional application built. However, things can get very complex very quickly in a large commercial application, and this is where CAL can really help simplify the whole programming model. In Part 2, I will expand the application into some thing a little more interesting, and I will also cover off how to go about dynamically skinning your application in a CAL fashion. I’ve done this to help illustrate how a collection of developers can co-ordinate their efforts in order to contribute to the final application. This is something that CAL helps achieve massively; in the CAG, they even talk of having off-shore teams working on modules etc. This needs a lot of co-ordination to cohesively achieve, however. There needs to be a very strong level of agreement in terms of how things are to be structured, and overall guidance is required to make sure that different teams approach the application development with a shared vision. It is very, very easy for different developers/teams to approach things differently and basically compromise the benefits that CAL offers. This is like a lot of the things you find yourself doing in life. You do it without thinking, then all of a sudden someone comes along and refers to it as “blah-de-blah”, and you go … “Whoa … is it?? ?” Well, Dependency Injection is one of those things. It sounds all big and grown up and ‘advanced’, but it really is little more than having a class without a parameterless constructor – you inject a thing this class depends on to function. OK, that is a stupidly simple explanation, and doesn’t even take into account the Unity Container, but it is the crux of the issue really. I’ve even made a chart!!! 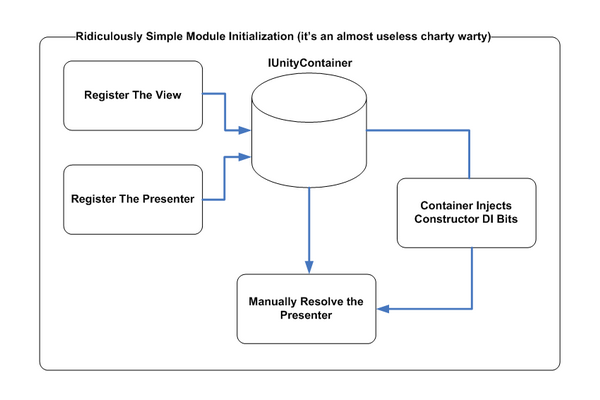 This is a very high level overview of just what the Unity Container is doing. In terms of using a basic MVP pattern, when a module is discovered, its Initialize() method is called; this in turn calls an optional RegisterViewsAndServices() method which registers a module’s views and services inside the DI container (Unity). Then, when an object is resolved from the container, it will either make an instance of that object and inject the dependencies it finds on the constructor, or it will return a singleton-type instance if the object being resolved has been registered in the container with a ContainerControlledLiftTimeManager. This is simply awesome in my opinion. You can read more about this in the CAG and on Martin Fowler’s website. It is basically a way of providing a loosely coupled (damn, I was trying to write this doc without using that phrase! !, lost that bet!) way to provide communication between entities that are not directly linked; this is also known as indirection. The event aggregator manages a list of events and subscribers, and manages the forwarding of these events to whoever has subscribed to a given event. This is by no means the best and only way to communicate in all situations. It is very easy to misuse this. If you were in a situation where you require a response, for instance, this is not what the event aggregator is designed for; it cannot enforce such a concept, and should not be used in this situation. The event aggregator is essentially a fire and forget method of communication. The other ways modules can communicate is with shared services within the application. These would most likely be other non-UI modules within the application that a number of other modules use as a service. You would encapsulate the logic and task based stuff inside this ‘service provider’ module and then expose it through registering its internal types within the UnityContainer with the corresponding interface. Another method of communication is through commanding. The CAL DelegateCommand<> works in very much the same way a standard WPF command. However, in order for the CanExecute to be evaluated, you have to manually invoke the RaiseCanExecute() method on the command. You can have commands for the Presenters, or you could make use of Global Commands. In the demo presented here, these globally available commands would live in the Core of a module, and anything subscribing to these commands would register themselves here and await execution. The StockTrader reference implementation application has an idea of an Infrastructure library that contains all the shared/common objects that form part of the application. These will range from the DI interfaces, event definitions, event payloads, commands, global commands etc. In contrast to this, my demo does not use this approach. For a large application, this single shared library approach being built / depended on by multiple developers could very easily turn into an unwieldy beast of a library; instead, my demo modules provide a core library should they need to provide access to their innards to other modules. When a module is built, it will be copied into the composite location (where the app is executable), and into a common Int directory; this is where you can reference it statically (the core not the module) in order to “get at” its innards, by placing its interface on a constructor and asking Unity to inject it, or in order to subscribe or publish events. It is very possible for a module to be so encapsulated that it may only ever need to subscribe or publish event aggregator events, in which case, using this approach, it wouldn’t even have a core since no other module needs to directly interact with it, nor it any other module. You can see this in the Navigator module in the demo code. The shell in this demo is the main region container. This could actually be farmed off into a module, or it could be contained in the main executable of the application. For this demo and to keep it simple (this is an introduction after all), this is a view in the main executable of the application. Here is the XAML that defines that view and creates the regions and registers them with the RegionManager. 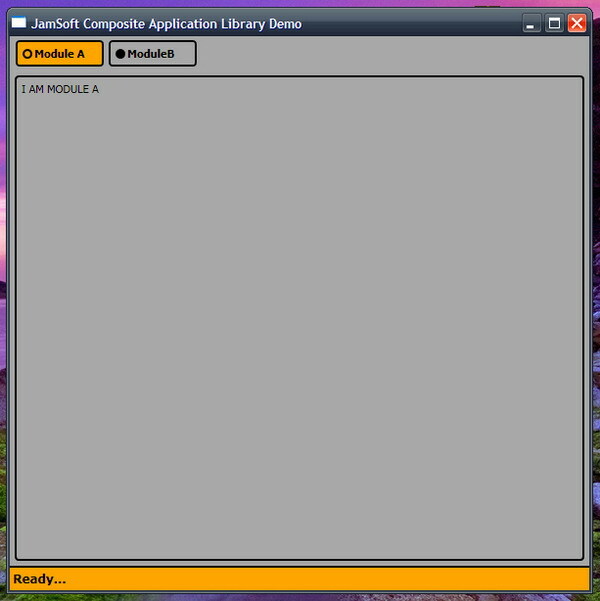 Title="JamSoft Composite Application Library Demo"
The executable is also the portion of the application that is the meat of configuring the container through the JamSoftBootstrapper. This class inherits from the UnityBootstrapper. Its job is to create and configure the container and register the shell view in the container. I won’t go into the details of this as there is literally a plethora of things you can do here as you would expect, all well beyond the scope of this article. There are all manners of region adaptors that could be included here; there is a rather nifty WindowRegionAdaptor, for example, in the CodePlex CompositeWPFContrib project that you can use for pop-ups and launching other windows with their own regions and views. This actually is an important part of the CAL framework; as with any good framework, it is customisable and extendable. You can even replace the Unity container with the container of your choice, if you like. This is a really neat thing about CAL. The ability for it to discover the modules at runtime. There are a few other methods, and you can also manually add these through various methods in the code or configuration files. I really like the dynamic approach using the DirectoryLookupModuleEnumerator. Basically, your app starts up, the shell does its bits, and part of that is finding and initialising the modules. With the demo code, I have used the above mentioned IModuleEnumerator. 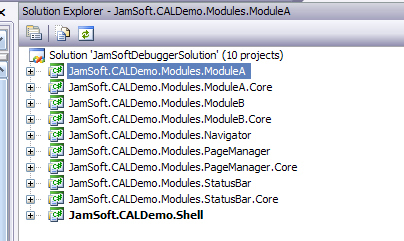 This basically looks at all the DLLs in the specified directory and loads anything that implements IModule and is decorated with ModuleAttribute. Once all of that is complete, it then works through these modules, injects anything on that class’ constructor (IUnityContainer at the very least in order to register types), and runs the Initialize() method to prepare the module for use. There are loads of variations on this such as MVC, MVVM, etc … etc … Suffice to say that it is actually pretty simple. You have a View (V), a Model (M), and a Presenter (P); very often, the M + P are the same thing. The decision on which to use is obviously your call; however, you don’t want a massively complex model in your presenter, for instance. That would also be missing the point massively really since these constructs are there to make life easier not harder. Using this as basis for your structure is great taking into account WPF data binding bits; you can end up with a really powerful set of classes with very little actual code. Also, the less code-behind in the view classes, the better. What has happened here is that the IStatusBarView has a single property defined as the same type as the interface implemented by our presentation model. So, when our presentation model is resolved from the container, the container makes an instance of the view when it injects the other required bits into the presenter. Then, the presenter sets itself as the model on the view. Now, all the various bindable bits on our presenter are available within the DataContext of the view, primed for use as WPF Bindings. There really is some great information about this in the CAG stuff, so I won’t go into any more detail here. These two interfaces could have actually been left inside the main module assembly. We know this since we also know that no other module requests IModuleAPresenterModel anywhere else in the application (you can see a functioning version of this with the Navigator). However, this does provide a nice simple demo of how you can work without an Infrastructure library bringing all these things together. In turn, module A has static references to its own Core and to the PageManager Core. This is so that the ModuleAPresenter can request a reference to the PageManager by asking the container to inject a reference to IPageManager in order to add itself as an available page in the application. Then, the Navigator module also has a reference to the PageManager Core so it can get a reference to the ObservableCollection<IPage> in order to then make these pages available in the navigator’s ListBox for navigating around the application. As you look through the code, you will see that the PageManager module is set to load at start-up so that we can be sure that it is available for presenters to register themselves as an instance of an IPage object and add themselves to the page manager. This isn’t absolutely necessary, since registering a module dependency inside modules that need to register a page will ensure that the PageManager module will be initialised before any modules that declare a dependency on it. The Navigator module registers a module dependency on the PageManager as it is the service within the application that it uses to control the view in the application’s MainRegion. The Navigator is an ItemsControl region that hosts a ListBox. The ListBox item template is then used to style the items, and look like traditional buttons that users can click in order to navigate to the various pages in the application. So to summarise, the navigator publishes an event defined in the PageManager’s Core assembly which the PageManager is in turn subscribed to. This in turn selects the page and then fires off another event to the MainRegionController, which does the actual view switching for the MainRegion defined in the Shell view. It just contains a presenter and a view and the associated bits to make it a module. It has a static reference to the PageManager Core in order to register itself as a page in the application. However, ModuleB is able to publish a string message to the StatusBar module. When you enter text in the TextBox supplied in the view and then hit the button, the text from the textbox is “pinged” to a CompositeWpfEvent which has a payload of string. This is then forwarded to the subscribed modules (StatusBar), and each module can then use this to do the required steps. In the case of the StatusBar, it simply prints the text to the screen in the TextBlock within a StatusBarItem. Simple. How is this all organised? There are a couple of ways of dealing with this. The all in one solution is nice and simple, but if you are working in a team of developers, this is not the best solution. The demo code is organised into the following directory structure when compiled. When you build the app, the various assemblies are distributed using post build events into the various locations within the bin\xxxx directories. External stuff such as third party control DLLs and CAL itself go into the External directory; all the cores and any other DLLs you produce (your own control source code) go into the Internal directory, and the modules themselves go into the Modules directory in order to allow the DirectoyLookupModuleEnumerator to find them at runtime. Another way this can be achieved is using environment variables. Your solution structure on disk may be so that this becomes a much more manageable approach, in fact. Once environment variables are set, you are not relying on complete paths to things, nor are you replying on the macros available through the post build event editor within Visual Studio. I think I’ll leave it there for now. This really is skimming the surface, and to some extent, that was the idea for this article. In the next article, I’m going to expand on this application and build in some more interesting functionality. What I will also cover in Part 2 is a module I have built that powers dynamically discovering style DLLs in much the same way as CAL discovers your modules. Your users can then pick their favourite skin at run-time. Now it’s time to move on to Part 2 of the demonstration.